This is a redrawn map for Bob Kalinowski's game Clash of Monarchs, published in 2008 by GMT Games. 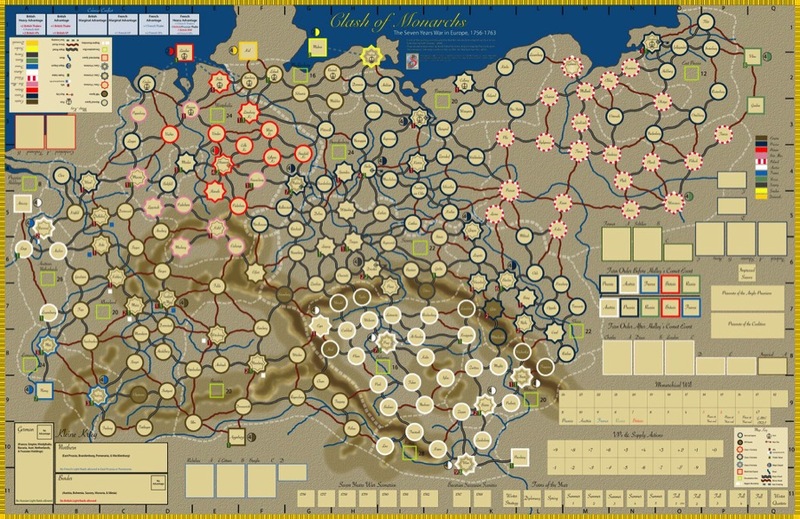 Clash of Monarchs is an elegant CDG covering the Seven Years War in Europe. This map is fully compatible with the game, stylistically similar but with improved functionality, and incorporating official errata. Permission has been granted by Gene Billingsley of GMT to sell this map independently. 2) hit the Add to Cart button. Important. Only two shipping options are given: North America and Overseas. Shipping charges have been included in the final price. Digital copies are not available. If you prefer a payment method other than PayPal™ contact us by email at rsgmail@shaw.ca or use the contact form below.